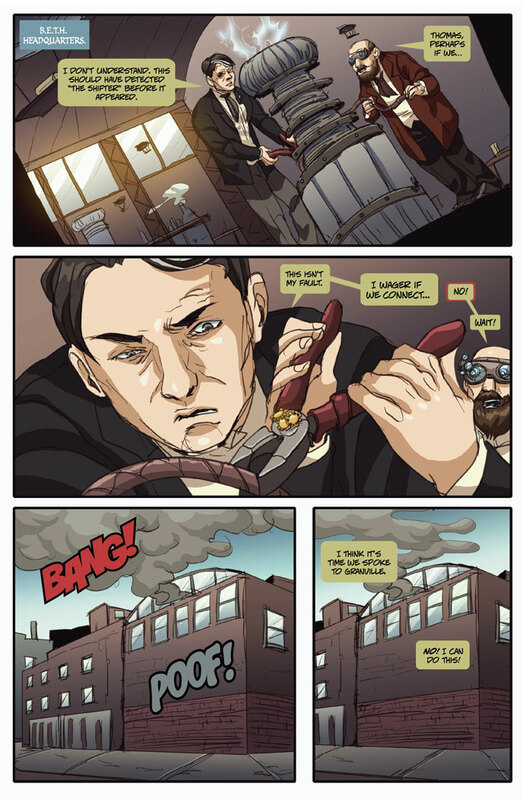 Boston Metaphysical – New Page, The Geekie Awards and More! Page 3 is now live and it looks like Edison is at it again. Will he never learn? I’ve got some exciting news this week…first of all the comic was nominated for Best Comic/Graphic Novel for the upcoming Geekie Awards. (Winners will be announced at the show on August 17.) I’m so proud of our entire team. They have done an awesome job. My husband and I will be attending which begs the question – what am I going to wear? The other news is that I will be a panelist on the When Steampunk and Pop Culture Collide panel at the San Diego Comic Con on July 24th, Noon in Room 29A. If you are there, please stop by. If you want to jump ahead of everyone else, the complete Chapter 4 is now available in print with bonus material. You can purchase it here: Chapter 4 Print Edition. I’ve got more news coming, so stay tuned! Page 4 will be uploaded on Wednesday next week as I’ll be heading to San Diego.